Jeff Sessions, U.S. Attorney General, requested the resignations of 46 U.S. Attorneys on March 10, 2017. On March 10, 2017, Jeff Sessions, who was appointed United States Attorney General by President Donald Trump, requested the resignations of 46 United States Attorneys. Some resignations were declined by Sessions or Trump. Media outlets described Sessions' move as abrupt and unexpected but not unprecedented. It is typical that when a new president enters office, that many sitting U.S. Attorneys depart on their own initiative before their term in office has concluded, or they are asked to resign. The other 47 U.S. Attorney posts were either already vacant by the end of Obama's administration or the incumbent U.S. Attorney had resigned at the beginning of Trump's administration. 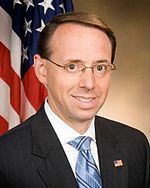 President Donald Trump declined to accept the resignations of Dana Boente (left) and Rod Rosenstein (right). 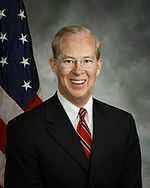 Trump declined to accept the resignations of Boente (Eastern District of Virginia), who was serving as Acting Deputy Attorney General, and Rosenstein (District of Maryland), whom Trump had selected to become Deputy Attorney General. Trump also allowed Daly (District of Connecticut) and Hartunian (Northern District of New York) to remain in office for a period of several months until they completed 20 years of service at the Justice Department. Initial media reports described Sessions' move as abrupt and unexpected, but not unprecedented. Slate's Leon Neyfakh accused media outlets of sensationalizing Sessions' actions, which he said were "nothing particularly unusual or surprising", and noted the mass firings of U.S. attorneys accompanying each presidential transition. National Review pointed out that Janet Reno began her tenure as President Bill Clinton's attorney general in March 1993 by firing U.S. attorneys for 93 of the 94 federal districts, this being more than twice as many as Trump attorney general Sessions fired on Friday. The Washington Post contrasted the Trump administration's decision with those of George W. Bush and Barack Obama, who replaced U.S. attorneys gradually. Sessions' move came less than 24 hours after Sean Hannity, the Fox News commentator and host of The Sean Hannity Show, called for the "immediate expulsion", or a "purge", of Obama appointees at the United States Justice Department in his show's opening monologue. Senator Dianne Feinstein (D-CA), the ranking member of the Judiciary Committee, criticized the "abrupt firing. " She said, "Under previous administrations, orderly transitions allowed U.S. attorneys to leave gradually as their replacements were chosen. This was done to protect the independence of our prosecutors and avoid disrupting ongoing federal cases. At a time when Attorney General Sessions has recused himself from major investigations into the Trump campaign, the independence of federal prosecutors could not be more important." Tim Purdon, who served as U.S. attorney for the District of North Dakota from 2010 to 2015, said: "The way the Obama administration handled it was appropriate and respectful and classy. This saddens me because many of these people are great public servants and now they are being asked to leave." Senator Chuck Schumer (D-NY) said he was "troubled to learn of reports of requests for resignations from the remaining U.S. Attorneys, particularly that of Preet Bharara." Other politicians expressed dismay, such as former Vermont Governor Howard Dean, Massachusetts U.S. Senator Elizabeth Warren, New York State Republican Assemblyman Steve McLaughlin, and Brian Kolb, the Assembly Leader, over Bharara's firing. Preet Bharara said he was fired after refusing to submit his resignation. Bharara said he was fired and did not resign. He had been asked to maintain his position in November 2016 by then President-elect Trump. Trump’s Secretary of the Department of Health and Human Services, Tom Price, traded stocks of health-related corporations during the time period when Price was working on crafting the legislation that would affect those firms. Bharara was said to have been supervising an investigation about the propriety of those trades. The administration did not respond to questions regarding the relationship. Bharara was also reported to have been investigating the reports via CNN, the New York Times, the Washington Times, New York Magazine, among other sources, that Fox News had covered up dozens of reports of sexual assault and harassment by its dismissed former Chairman and CEO Roger Ailes, generating potential tort liabilities that should have been disclosed to its shareholders. Fox attorney and potential Bharara replacement Marc Mukasey, declined to comment on these reports as well. In his resignation statement, Capers wrote, "This afternoon, I was instructed to resign my position as United States Attorney for the Eastern District of New York, effective March 10, 2017. It has been my greatest honor to serve my country, New York City and the people of this district for almost 14 years, with the last 17 months serving as United States Attorney." Capp said in a written statement, "After 31 years at the United States Attorney’s office I have submitted my resignation as United States Attorney. I had advised my office last summer that it was my plan to retire in 2017. I had been looking toward a June retirement, so this is just a few months earlier. It has been my greatest honor and privilege to serve all these years. The work we do in the United States Attorney’s Office has such an important positive impact on the citizens of northern Indiana. I want to thank the men and women of the USAO for their dedication and professionalism, day-in and day-out." Cotter said, "I think it's very unprofessional and I'm very disappointed. What happened today on Friday, March 10, that was so important that all Obama appointees who are US attorneys need to be gone? I gotta write that (resignation) letter. It's going to be a one-liner." Daly's office released a statement which said, "It has been a great honor and privilege to serve as Connecticut's United States Attorney. In fact, it has been a gift of a lifetime. I am extremely proud of the tremendous accomplishments of the men and women of this office during my tenure." Delahanty said, "I didn’t really get a chance to wrap up any loose ends. By Monday morning, my email and iPhone had been shut off." Fishman said in his statement, "It has been the greatest professional experience that I can possibly imagine to have served in this office for the past seven-and-a-half years. Having spent so much of my career working to protect the interests of the people of New Jersey, I can think of no greater form of public service. I am enormously grateful for the opportunity I was given to lead the men and women who work in this office. They are the most extraordinary group of public servants I have ever known, and I am more than honored to have been their colleague." Magidson's release said, "It has been privilege and an honor to serve as the United States Attorney for the Southern District of Texas. It has been a hallmark of my administration to ensure that our office lived up to the ideals of justice. The ability to everyday protect the interests of the United States has truly been a great blessing and a hallmark of my career. I am confident that our office will continue to live up to these ideals." McQuade said, "I have loved serving in this job as much as anyone has ever loved any job. It has been an incredible privilege to work alongside public servants who devote their tremendous talents to improving the quality of life in our community. I am proud to have served as U.S. Attorney in the Obama Administration." ^ a b c d Schechtman, Joel; Hosenball, Mark (March 10, 2017). "Sessions asks 46 Obama-era U.S. attorneys to resign". Reuters. Retrieved March 10, 2017. ^ a b c Neyfakh, Leon (March 10, 2017). "Yes, Trump and Sessions Just Cleaned House at the DOJ. No, It's Not Shocking". Slate. The Slate Group. Retrieved March 10, 2017. ^ Wilber, Del Quentin (March 10, 2017). "Jeff Sessions asks 46 Obama-appointed U.S. attorneys to resign". Los Angeles Times. Retrieved 16 June 2017. ^ a b c d e f g h i j k l m n o McKelvey, Wallace (March 10, 2017). "Justice Department calls for 46 Obama U.S. attorneys to resign". The Patriot-News. Advance Publications. Retrieved March 11, 2017. ^ a b Winter, Tom; O'Donnell, Kelly; McCausland, Phil (March 11, 2017). "U.S. Attorney Preet Bharara Says He Did Not Resign and Was Fired by DOJ". NBC News. Retrieved March 11, 2017. ^ Winsor, Morgan; Faulders, Katherine; Sands, Geneva; Margolin, Josh (March 11, 2017). "Prominent US Attorney Preet Bharara remains on job after Sessions seeks resignations". ABC News. Retrieved March 11, 2017. ^ Wilson, Jenny (March 10, 2017). "Sessions asks for resignations of 46 US attorneys appointed by Obama". Las Vegas Review-Journal. ISSN 1097-1645. Retrieved March 10, 2017. ^ a b "U.S. attorney for Indiana's northern district resigns". South Bend Tribune. South Bend, Indiana: Schurz Communications. March 11, 2017. Retrieved March 11, 2017. ^ Kato, Dillon (March 10, 2017). "AG Sessions asks U.S. attorneys, including Montana's, to resign". Missoulian. Lee Enterprises. ISSN 0746-4495. Retrieved March 11, 2017. 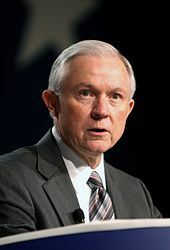 ^ a b "Sessions asks for resignation from 46 US attorneys, including Montana's". Great Falls, Montana: KRTV. March 10, 2017. Retrieved March 11, 2017. ^ Wenzel IV, Joseph (March 10, 2017). "U.S. Attorney General for CT resigns after Sessions announcement". Hartford, Connecticut: WFSB. Retrieved March 10, 2017. ^ Wilber, Del Quentin (March 10, 2017). "Jeff Sessions asks 46 Obama-appointed U.S. attorneys to resign". Los Angeles Times. tronc. ISSN 0458-3035. OCLC 3638237. Retrieved March 10, 2017. ^ Horwitz, Sari (March 10, 2017). "Maine's U.S. attorney among 46 Obama appointees asked to resign". Portland Press Herald. Retrieved March 11, 2017 – via The Washington Post. ^ "US Attorney for Western District in Missouri Resigns". U.S. News & World Report. March 11, 2017. Retrieved March 11, 2017. ^ Rogers, Phil (March 10, 2017). "US Attorney Fardon Expected to Resign as Part of AG Sessions' Order: Sources". NBC Chicago. Retrieved March 11, 2017. ^ "United States Attorney Stephanie A. Finley retiring after 25 years of federal service". Lafayette, Louisiana: KATC. March 10, 2017. Retrieved March 11, 2017. ^ a b "N.J. federal prosecutor Fishman resigns at Trump's request". The Record. Woodland Park, New Jersey: Gannett Company. March 10, 2017. Retrieved March 10, 2017. ^ Tucker, Eric; Gurman, Sadie (March 11, 2017). "AG Sessions seeks resignations of 46 US attorneys — including Utah's". The Salt Lake Tribune. ISSN 0746-3502. Retrieved March 11, 2017. ^ Boyce, Rod (March 10, 2017). "Alaska's top federal prosecutor among 46 asked to resign by US attorney general". Fairbanks Daily News-Miner. Fairbanks, Alaska: Helen E. Snedden Foundation. ISSN 8750-5495. Retrieved March 11, 2017. ^ "Alaska's U.S. Attorney asked to resign by Attorney General Sessions". Anchorage, Alaska: KTUU-TV. March 10, 2017. Retrieved March 11, 2017. ^ "At Sessions' request, Minnesota US Attorney Luger resigns". Star Tribune. Minneapolis: Star Tribune Media Company. March 10, 2017. OCLC 43369847. Retrieved March 10, 2017. ^ "U.S. Attorney Andy Luger Resigns at Request of Sessions Justice Dept". CBS Minnesota. March 10, 2017. Retrieved March 10, 2017. ^ a b Burns, Gus (March 10, 2017). "Trump orders U.S. Attorney for eastern Michigan Barbara McQuade to resign". MLive.com. Advance Publications. Retrieved March 10, 2017. ^ Baldas, Tresa (March 10, 2017). "U.S. attorney McQuade confirms she'll resign as Sessions sweeps clean". Detroit Free Press. Gannett Company. ISSN 1055-2758. OCLC 474189830. Retrieved March 11, 2017. ^ Glenn, Mike (March 10, 2017). "U.S. attorney in Houston steps down as Sessions seeks resignations across the nation". Houston Chronicle. Hearst. ISSN 1074-7109. Retrieved March 10, 2017. ^ a b "U.S. attorney for RGV resigns after AG asks for Obama appointees to quit". The Brownsville Herald. Brownsville, Texas: AIM Media Texas. March 10, 2017. Retrieved March 11, 2017. ^ "New Mexico's US attorney submits requested resignation". The Wichita Eagle. The McClatchy Company. March 11, 2017. ISSN 1046-3127. OCLC 20386511. Retrieved March 11, 2017. ^ "Trump seeks resignations of 46 U.S. attorneys, including Hawaii's Nakakuni". Honolulu Star-Advertiser. Black Press. March 10, 2017. Retrieved March 11, 2017. ^ Gutierrez, Ben (March 10, 2017). "Hawaii's U.S. Attorney among those asked to resign by Justice Department". Hawaii News Now. Retrieved March 11, 2017. ^ Eversley, Melanie (March 11, 2017). "Sessions seeks resignations of 46 U.S. attorneys". KHOU. Retrieved March 11, 2017 – via USA Today. ^ Mulvaney, Katie (March 10, 2017). "Rhode Island's U.S. Attorney Neronha ousted by U.S. Attorney General Jeff Sessions". The Providence Journal. Providence, Rhode Island: Local Media Group. Retrieved March 11, 2017. ^ "US Attorney Oberly says he learned of his ouster from friend". The Washington Times. Washington, D.C. March 11, 2017. ISSN 0732-8494. OCLC 8472624. Retrieved March 11, 2017. ^ Hammerand, Jim (March 10, 2017). "Trump administration seeks resignation of Washington state U.S. attorney". Puget Sound Business Journal. Seattle: American City Business Journals. ISSN 8750-7757. Retrieved March 11, 2017. ^ "Two U.S. attorneys for Louisiana step down". The Daily Advertiser. Lafayette, Louisiana: Gannett Company. March 11, 2017. Retrieved March 11, 2017. ^ Heisig, Eric (March 10, 2017). "AG Sessions asks U.S. attorneys from Obama administration to resign, including Ohio's Carole Rendon". Cleveland.com. Advance Publications. Retrieved March 10, 2017. ^ Grunik, Katie (March 10, 2017). "Middle Tenn. US Attorney to resign per Jeff Sessions' request". WZTV. Retrieved March 11, 2017. ^ Reilly, Ryan J. (March 10, 2017). "Jeff Sessions Asks Top Federal Prosecutors To Resign". The Huffington Post. Retrieved March 10, 2017. ^ Mesch, Shelly (March 11, 2017). "U.S. Attorney John Vaudreuil to resign Monday". Wisconsin State Journal. Madison, Wisconsin: Lee Enterprises. ISSN 0749-405X. Retrieved March 11, 2017. ^ Farrell, Greg; Berthelsen, Christian; Talev, Margaret (March 10, 2017). "Bharara, Wall Street's Enforcer, Other Lawyers Asked to Quit". Bloomberg.com. Bloomberg L.P. Retrieved March 10, 2017. ^ Savage, Charlie; Haberman, Maggie (March 10, 2017). "Trump Abruptly Orders 46 Obama-Era Prosecutors to Resign". The New York Times. The New York Times Company. ISSN 0362-4331. OCLC 1645522. Retrieved March 10, 2017. ^ Gerstein, Josh (March 13, 2017). "2 more U.S. attorneys win reprieves from dismissal order". Politico. Retrieved March 13, 2017. ^ a b Joseph, Cameron; Bekiempis, Victoria; Dillon, Nancy (March 10, 2017). "AG Jeff Sessions seeks Manhattan U.S. Attorney Preet Bharara's resignation along with 45 others". New York Daily News. OCLC 9541172. Retrieved March 10, 2017. ^ Winter, Tom; Helsel, Phil (March 11, 2017). "Way in Which U.S. Attorneys Told to Resign Came as Surprise: Source". NBC News. Retrieved March 11, 2017. ^ McCarthy, Andrew C. (March 10, 2017). "Sessions's Firing of 46 Obama-Appointed U.S. Attorneys Isn't Scandalous". The National Review. ISSN 0028-0038. Retrieved March 12, 2017. ^ Horwitz, Sari; Barrett, Devlin (March 10, 2017). "Justice Department tells all remaining Obama administration U.S. attorneys to resign". The Washington Post. ISSN 0190-8286. OCLC 2269358. Retrieved March 10, 2017. ^ a b Wheeler, Lydia (March 10, 2017). "Sessions asks 46 Obama-era US attorneys to resign". The Hill. Washington, D.C.: Capitol Hill Publishing Corp. ISSN 1521-1568. Retrieved March 10, 2017. ^ Hensch, Mark (March 10, 2017). "Schumer 'troubled' by Sessions's request for US attorneys' resignations". The Hill. Retrieved March 10, 2017. ^ Caplan, David; Hayde, Michael Edison (March 12, 2017). "Democrats, some Republicans, condemn Preet Bharara being 'fired'". ABC News. Retrieved March 14, 2017. ^ "US Attorney General Jeff Sessions asks 46 Obama-era attorneys to resign". The Straits Times. Singapore: Singapore Press Holdings. March 10, 2017. OCLC 8572659. Retrieved March 10, 2017. ^ Fired U.S. Attorney Preet Bharara Said to Have Been Investigating HHS Secretary Tom Price, ProPublica, Robert Faturechi, March 17, 2017. Retrieved 18 March 2017. ^ US Attorney Preet Bharara Was Investigating Fox News When Trump Fired Him, Media Matters for America, Zachary Pleat, March 12, 2017. Retrieved March 25, 2017. ^ Halper, Daniel; Whitehouse, Kaj; Conley, Kirstan (March 10, 2017). "Jeff Sessions tells 46 US attorneys appointed by Obama to resign". New York Post. News Corp. ISSN 1090-3321. Retrieved March 10, 2017. ^ Russell, Eric (March 18, 2017). "Former U.S. attorney for Maine reflects on his sudden ouster". Portland Press Herald. Retrieved March 20, 2017.